The last time the New York Knicks won a playoff series, a 15-year-old Carmelo Anthony had just finished his growth spurt. While the Knicks were outlasting the Miami Heat in the 2000 Eastern Conference semifinals in seven games, thanks to a phantom timeout call awarded to Latrell Sprewell (who admitted he hadn’t called one), young Carmelo Anthony was adjusting to what was happening to his body. He had grown four inches in less than a year, transforming from a skinny point guard to a massive Über-prospect who towered over his classmates at Towson Catholic High School outside Baltimore. Of the seventeen men who played in that Game 7, only two are still in the NBA (Kurt Thomas, a backup forward with the Bulls, and Anthony Carter, currently Carmelo’s teammate with the Knicks). Between that night, May 21, 2000, and Sunday’s NBA playoffs Game One against the Boston Celtics, 3,984 days passed. During that time, the Knicks have hosted eight playoff games, winning only three. Since ­Carmelo, a four-time All-Star, entered the league in 2003, his former team, the Denver Nuggets, has never missed the post­season, and Anthony has played in a total of 45 playoff games (not counting Sunday’s contest). During that same period, the Knicks played four playoff games and lost each one. For the past six seasons, during the NBA playoffs, the Garden has gone dark. Among the many attributes Carmelo has brought to this success-famished Knicks franchise, one of the less heralded is the basic fact that, to him, the playoffs are a normal, obvious progression from the regular season, rather than something you have to pinch yourself about to believe is really happening. Knicks fans are doing backflips that there are real, live playoff games to watch. That the last decade of pain—amazing, comical, ridiculous pain—has led to a return to relevance. Forgive Carmelo for not understanding the traffic Armageddon a tailgate outside Penn Station would induce. He is new here, even if this is his home. This has perhaps been the strangest season in recent memory both for the Knicks and Carmelo Anthony. For all the outrage directed at LeBron James and his much-­derided ESPN event “The Decision” (in which he took an hour of prime-time programming to break the hearts of Cleveland Cavaliers fans and sell Vitaminwater), the Knicks and Carmelo have spent every minute since that program trying to be exactly like LeBron. LeBron’s decision to go to a super-team in Miami (a team that has so far been more super in theory than practice) caused nothing but envy for both the Knicks and Carmelo. The Knicks, having signed Amar’e Stoudemire, immediately set about trying to find another superstar to team with him, Heat style. And Carmelo, in Denver, sullen, bored, and heading toward the end of a contract with a labor war looming, set about trying to get himself out of town, to get himself a superstar running mate or two, and of course to get himself paid. The Knicks and Carmelo were such a match they even flirted at Carmelo’s wedding, held the weekend after LeBron’s decision. (Stoudemire had to apologize to the Nuggets owner for all the Knicks talk at the event.) The Knicks hadn’t had a player of Stoudemire’s caliber since Ewing; the footsie with Carmelo was a wish for two of them. And then something strange and wonderful happened: The Knicks, with Stoudemire, got good. Not dominant, mind you, but fun, giddy, and occasionally thrilling—an offensive juggernaut that featured Stoude­mire, having his best season, surrounded by young, emerging players like Danilo Gallinari, Raymond Felton, Landry Fields, and Wilson Chandler, ideally suited for the system that coach Mike D’Antoni had desperately wanted to run for two years. The Knicks didn’t always win, but they lit up the Garden as it hadn’t been lit in years. Following a wild, ecstatic, nationally televised loss to the defending Eastern Conference champion Celtics in December, Boston guard Paul Pierce said, “The Knicks have arrived.” ­After a decade of Isiah Thomas and Jim Dolan and Stephon Marbury and Anucha Browne Sanders, this Knicks team felt like a purifying cleanse. We had earned this. Then the trade went through. The Knicks sent all those young guys, all but Fields, to Denver for Carmelo and veteran point guard Chauncey Billups. At first, many (including me) debated the wisdom of the trade, considering the Knicks had gutted their free-flowing, exuberant roster and sacrificed hard-earned salary-cap room in the midst of their first playoff season in a decade for a man whose offensive strengths (isolation, hop-step jumpers) seemed so ill-suited to D’Antoni’s system. The trade was also questionable because the Knicks could have called Carmelo’s bluff and hoped to try and sign him as a free agent, post-lockout, avoiding the need to give up so many players. But everybody wants something, and that is part of the job description when you are the savior of the Knicks, with a fan base so burned by the Isiah years that, even in its ­excitement, it’s always waiting for the hatchet to drop again. (If it’s any reassurance, ­Carmelo says he hasn’t talked to Isiah “in years” and met Jim Dolan for the first time during the All-Star break.) And what this fan base wants more than anything is, of course, a championship. When Carmelo’s handlers asked if I’d be interested in coming with him to visit the Red Hook West housing projects in Brooklyn where he was born and lived until he was 8, I said yes, obviously, but with considerable skepticism. Much of this “Carmelo comes home!” story line that accompanied his arrival has seemed to be MSG hype. After all, he left when he was 8. What was he going to show me? Over here, I ate some candy. Over there, I watched some cartoons. Here, I skinned my knee. It took about 30 seconds at the cracked, faded basketball court right next to the building where Anthony was raised for that skepticism to vanish. While Carmelo waited in an SUV as the photographers for this story set up their equipment, I watched as hundreds of Red Hook West residents converged upon the court. “The only time people come here is when something’s going on with Carmelo,” said 18-year-old Rock Harris, a resident of the housing project, explaining how everyone was tipped off. As Carmelo dribbled and shot on the same court where he dribbled and shot as a grade-schooler, and as our photographers snapped away, he began to chat with an older man he recognized, one of the hundreds now standing on the sidelines. “Ronnie!” he said. “Damn, it’s been forever.” Ronnie was laughing but appeared to be giving Carmelo some considerable gruff. “Yeah, you ain’t nothin’, ” Ronnie said, over and over, laughing and laughing, along with Carmelo. 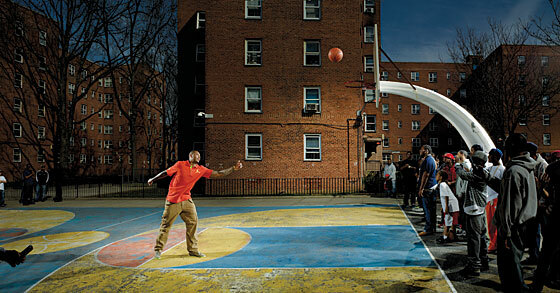 “Ronnie” was Ronald Brown, 48, who has lived in the Red Hook West projects his whole life. He also used to play basketball with Carmelo’s father. In the oft-told history of Carmelo’s journey from Red Hook to Baltimore to Syracuse University to the NBA, his father, who died of cancer when Carmelo was 2, is a muted footnote, the tragedy that spurs our hero onto his journey. But to Ronnie, Carmelo Sr. is a legend. A few years younger than Carmelo’s father, he was one of his closest friends and was with him throughout his fight with cancer. “Lots of people don’t know his pops,” he said. “I tell you, his dad was better. He was the best. Carmelo can’t carry his jock.” He then repeated this to Carmelo. “You couldn’t hold your dad’s jock, you hear that?” It was a relief to me that everyone was still laughing. Carmelo, wearing an orange Jordan-brand polo and a massive gold watch, continued to dribble as the crowd grew and grew. I asked him if he was going to go see his old apartment. “I’m working my way up to that,” he said, smiling. “Not sure I’m ready for that yet.” Nonetheless, when the shoot ended, he grabbed Miranda and his bodyguard and sprinted into Apartment 1C and stayed inside for about ten minutes as the crowd migrated to the door.